Cruise lines last year failed sanitation inspections at the highest rate ever since the Centers for Disease Control and Prevention’s Vessel Sanitation Program started holding cruise ships to its Operations Manual guidelines in 1990. MIAMI—Cruise lines have never had a cleanliness problem this big. In 2017, cruise lines failed their sanitation inspections at the highest rate ever since the Centers for Disease Control and Prevention’s Vessel Sanitation Program started holding cruise ships to its Operations Manual guidelines in 1990. Fifteen ships earned failing scores last year, a figure that dwarfs the average failure rate of about two to four ships a year, a Miami Herald analysis of the CDC’s historical inspection data found. The only year that comes close to 2017’s all-time-high figure is 2013, with 10 failures. In 2016, just four ships flunked their inspections, and from 2009 to 2011, there was only one failure a year. In 2017, the failures included five cruise ships from Doral-based Carnival Cruise Line, one from Miami-based Norwegian Cruise Line, one from Miami-based Oceania Cruises and one from Deerfield Beach-based Bahamas Paradise Cruise Line. A Caribbean ferry, Ferries Del Caribe’s Kydon, failed its inspection twice. Carnival has been quick to respond, adding staff training and changing procedures even though they face no legal penalties. Still, the line says, the failures correspond with a greater emphasis on administrative details during inspections that don’t necessarily reflect a ship’s cleanliness. The increase in incidents follows a significant increase in the size of the global fleet. In 2017, the number of cruise ships increased by about 6 percent from nearly 450 ships in 2016. But the spike in failures is still unusual, said Ross Klein, a professor at the School of Social Work at Memorial University of Newfoundland in Canada, who tracks cruise ship outbreaks, health issues and other factors. “We can say it’s the worst year, but also the best because it means inspectors are doing their jobs,” Klein said. There were a total of 255 inspections in 2017, with the majority of ships passing their inspections. Forty-one ships got perfect scores, accounting for about 16 percent of all inspections. The spike in failures, though more elevated than in recent years, still only accounts for 6 percent of all inspections in 2017. What triggered the increase remains unclear. Carnival Cruise Line, which snagged headlines when its ships failed four inspections from November 2017 to January 2018, said it has now implemented an intensive, fleetwide retraining process to avoid further failures. Carnival has passed two re-inspections out of the four so far, with inspections on the other two ships forthcoming. “All retraining is complete across our fleet. We have implemented continuing education, as well as biweekly conference calls for all of our food operations teams to share best practices and learnings,” the cruise line said in a statement. Cruise expert Stewart Chiron said the failures may be a result of more “aggressive” inspections. “I’m unaware of any internal personnel changes and know that no excuses have been offered up by Carnival during recent discussions,” Chiron said. The Vessel Sanitation Program randomly inspects ships that dock at U.S. ports at least twice a year to help control the spread of gastrointestinal illnesses like norovirus. The program first launched in 1975 but didn’t begin to hold ships to its VSP Operations Manual guidelines until 1990. Vessels are scored on a 100-point scale. A score of 85 or below is considered failing. All ships cited with violations are required to submit a Corrective Action Report detailing how they corrected the problems; vessels that fail are reinspected “within a reasonable period of time,” Treffiletti said. But a ship that fails an inspection a second time or a cruise line that has a string of failures faces few legal consequences. Most violations recorded on inspections are seemingly harmless, like corroded machinery or water pooling. Some are more significant and in some cases even show an intent from crew members to disguise the true condition of a vessel. 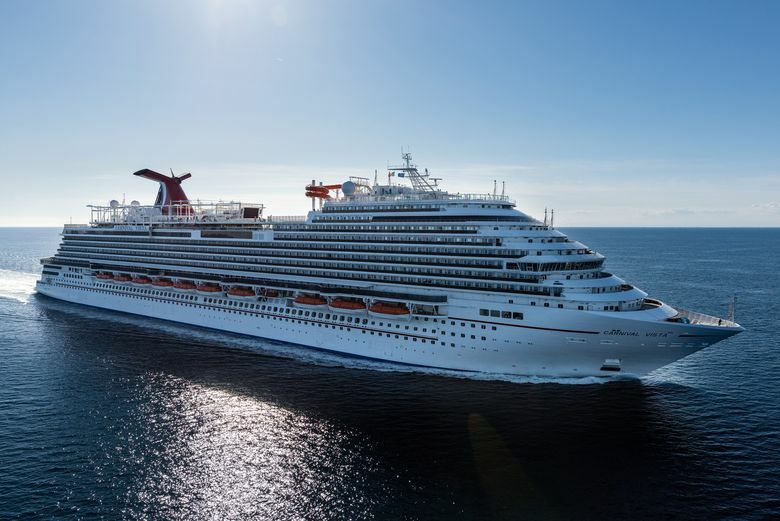 As recently as Dec. 2, an inspection of the Carnival Vista while the ship was docked in Miami found that crew had made an “organized effort” to hide potentially hazardous food, raw produce, utensils and other items in a crew cabin hallway and a crew cabin to avoid inspection. During several inspections in 2017, crew members were also found clocking back into work even though they showed symptoms of acute gastroenteritis. Klein said the inspection failures may reflect turnover within the Vessel Sanitation Program and within the cruise lines, which have grown exponentially in the last decade with larger ships. That rapid growth may have diluted the talent pool of employees on cruise lines who have extensive experience working on ships, he said. Most workers are hired from Asian nations where cruise-ship jobs are highly coveted. But previous hospitality experience is not always required, say experts. The cruise lines train the workers once they are hired, Klein said. Across the hospitality industry, hotels, restaurants and other entities are feeling the squeeze of a labor shortage as such businesses continue to grow. “I can’t see how the cruise industry would escape the erosions we have seen elsewhere in the service industry,” he said. But the Cruise Lines International Association refutes the claim that staffing challenges have led to inspection failures. Cruise ship jobs remain very popular, said CLIA spokeswoman Catharine Montgomery in a statement, with lines receiving up to 100 applications for each job opening. “In addition to their salary, crew members typically receive free medical care, room and board, meals and many other benefits that are often unavailable in their home countries,” Montgomery said. “Crew members are very satisfied with their jobs and the opportunities for career advancement, which explains why employee retention rates in the cruise industry are upward of 80 percent.”? For the past seven years, cruise lines have seen a downward trend on their average annual inspection scores, indicating that inspectors are catching ships with more violations per year. The final score is based on a point system, with points deducted if there is a pattern of similar violations or when there are significant individual violations. That means that a lower score, though passing, means more violations were found. Even ships that score 100 can be found with a half dozen violations or more. “If you look at the regulations in the past inspections, it’s pretty hard to fail. Even a ship with (a score of) 98 is found with lots of infractions,” Klein said. Since 2011, the average annual inspection score that the three major cruise lines — Carnival, Royal Caribbean International and Norwegian Cruise Line — have earned has been declining. For example, Norwegian ships earned about a 98 on average in 2011. Their average in 2017 was 96. (Norwegian declined to comment for this story). The Vessel Sanitation Program periodically changes its guidelines to incorporate new technologies, emerging public health issues, industry recommendations and other considerations. The guide was updated in 2011, before the decline in the scores began. Carnival said in a statement that the evolution of the program has created a greater focus on administrative issues that don’t necessarily represent a public health risk. Carnival and other lines all play an active role in the Vessel Sanitation Program’s continuation. They help fund the program, paying between $1,495 and $17,940 per inspection depending on the size of the ship, and also have a hand in developing new guidelines. Carnival, Royal, Norwegian and others were all involved in creating the 2011 guidelines. The inspection guide is set for another update this year, to reflect disease patterns and trends, emerging pathogens and other features, said Treffiletti of the VSP. Despite the overall trend toward lower scores, experts don’t see a direct correlation between ships that fail their inspections and those that are plagued by norovirus outbreaks. According to the CDC, the number of reported rates of diarrheal disease on cruise ships decreased 2.4 percent from 1990 and 2004. From 2008 to 2014, according to a recent report, that rate continued to decrease with only 0.18 percent of all cruise passengers in that time frame reporting cases of acute gastroenteritis. Increased rates of the illness happened in years that novel strains emerged, such as 2012, the CDC found. Of the 11 ships that reported having a gastrointestinal disease outbreak in 2017 to the CDC, only two ships also failed their sanitation inspections the same year. Of the two failed inspections, just one corresponded with the date of an outbreak on the same vessel. For cruise ships that do fail an inspection, there are few legal penalties. Ships that fail their inspections have to pay the cost of a re-inspection — up to $17,940 for most of the newest ships from mass market lines. “The VSP is a voluntary program … It doesn’t have any legislative or any legal sort of teeth to it,” Klein said. But there is an exception in extreme cases: If a ship’s sanitation condition presents an “imminent public health risk,” the Vessel Sanitation Program can issue a “no-sail” recommendation that, if ignored, can become an order. The U.S. Coast Guard enforces the order. A ship displaying an imminent public health risk may be facing an inability to keep food within safe temperatures, have inadequate facilities for cleaning and sanitizing equipment, or other factors, Treffiletti said. It’s only ever done so once: In 2001, a Greek-owned ship sailing in the Great Lakes, the Arcadia, earned a 59 on an inspection, then failed another but kept sailing when the CDC recommended it stop until the problems were corrected. The recommendation finally became an order when the ship failed a third inspection. If a ship’s sanitation condition presents an “imminent public health risk,” the Vessel Sanitation Program can issue a “no-sail” recommendation that, if ignored, can become an order. But an initial failure doesn’t necessarily mean the conditions on a ship pose a health risk to its passengers. And most major cruise ships with failing grades correct issues and pass their re-inspections. “A score of 85 or below does not necessarily mean the ship is unsafe and this is why no specific restrictions were placed on our vessels, other than to have them reinspected,” Carnival said in a statement. Still, the penalties are more severe for other land-based entities when they fail inspections, said John Hickey, a Miami-based maritime attorney with Hickey Law Firm. Most major lines also have a clause in their passenger contracts that denies a cruiser the ability to bring a class-action lawsuit against the line. In the case of a norovirus outbreak that may be the result of unsanitary conditions, it’s difficult for lawyers to bring a class-action suit against the line — nor is it financially feasible for them to do so when it’s just an individual case. Overall, the problems with ship sanitation remain so isolated that it’s clear the sanitation program has been a success, Klein said. The inspections have also received more attention in recent years, as consumers have become more adept at scrutinizing and rating facilities through the growth of sites like TripAdvisor and Yelp. Now, consumers are also looking at cruise lines with the same discerning lens through which they scrutinize other business in the service industry.